Its that time of year when clients come to see you, energized to change. As a weight-neutral educator, how do you navigate the annual desire to lose weight? 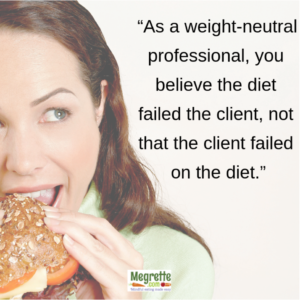 The following is a fictitious dialog using Motivational Interviewing to illustrate how to remain nonjudgmental when your clients want to lose weight. If you are thinking, wow, that was helpful, I would like to learn more about motivational interviewing; please consider attending the WN4DC Symposium. Kori Kostka is a motivational instructor in Canada and she has crafted the counseling track. To learn more about Kori and MI check out her course Motivational Interviewing with Mindful Eating course.